Old-growth stand of beech trees near the Pacific Coast of Hokkaido Island, Japan. Even though there are hundreds of forests types that exist all around the world, there are some major differences distinguishing two of the broadest categories, namely primary and secondary forests, from one another. According to the Convention on Biodiversity, primary forests are made up of native species that have developed naturally, with little or no evidence of human activities. As such, their original ecological processes remain largely undisturbed. These include forests recovering from natural disturbances such as storms and landslides. Secondary forests are those which are recovering from human disturbances, both in the short-term and the long-term. The recovery of the forest can be natural or by people intervention through reforestation or afforestation. The composition of plants and animals, and the structure of the forest is simpler than that of primary forests. Though the Convention on Biodiversity considers degraded forests as secondary forests, many scientists consider them a separate group. Old growth forests can be either primary or secondary forests. For many millennia, the development of civilization has resulted in the cutting down of forests to make way for agriculture, pastoralism, and for human settlement. Primary tropical forests in South America and Asia, have parts that have been cut for shifting agriculture many centuries ago. The present day pastures in Europe have replaced forests over a period of two thousand years. However, many primary forests on this continent have also remained standing throughout historical changes. North America lost much of its temperate forests in the last three hundred years. Temperate forests' deforestation peaked before 1700, and these have steadily declined further over the centuries since. Large scale tropical forest logging began in the 1800s, peaking in the mid-1900s. According to the World Bank, 30.8% of the global land area in 2015 was covered with forests. In 2005, primary forests made up one-third of the total forest areas. The largest primary forests are the tropical rainforests in Amazon. North and Central America, and Russia have large tracts of primary temperate rainforests. The Caribbean, Europe, and arid parts of Asia and Africa have less primary forests. The secondary forests, however, are increasing in extent. 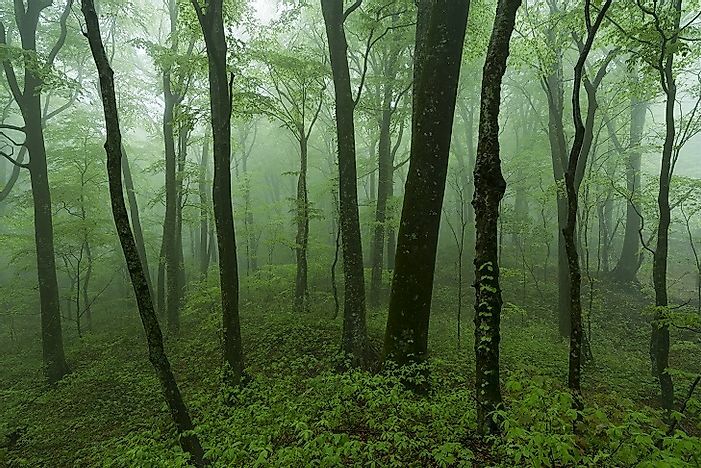 Most of the forests in North America and Europe have for long been secondary in nature. More of primary forests are being lost each year globally, making way for agriculture, plantations and urban sprawl. Around 60,000 square kilometers of forests are lost each year, most of which are in the tropics. Temperate forest loss since the start of this millennium has been negligible. Fire accounts for 1% of global forest losses, and insects and diseases for 3% of total forests lost. The habitats in primary forests are formed not just by the climate and soil conditions of the area, but are also influenced by the former presence of past forests. The soil and air temperatures get moderated by the presence of continuous tree cover, and there is more organic matter formation. Primary forest have a well developed stratification which creates a myriad of niches for other plants and animals. So all primary forests have a higher biodiversity than the secondary forests that replace them. Secondary forests have a simple stratification, and the species and type of plants found varies with the age of the forest. Most of the species are common ones which can survive the harsher growing conditions of open areas, and differ from the unique primary forests in the region. Despite this, secondary forests are valuable as they can still help maintain the biodiversity of the region, provide protection against soil erosion, and serve as sources of other valuable products such as timber and fuel wood. If left standing, secondary forests can also acquire more species over time, according to Mongabay. Shifting cultivation continues in many parts of Asia's forested regions, while South American and African forests are still being cleared for cattle rearing and agriculture. The rainforests in Indonesia are being cleared for palm oil plantations, and many forest in US are still being logged. Other forests especially in the tropics are used also for extraction of non-timber products. A 2014 Global Forest Watch report found that 2.3 million square kilometers of forests were lost between 2000 and 2012, while only 0.8 million square kilometers of secondary forests were added. Therefore, primary forests are still being lost faster than secondary forests are replacing them. What Are the Differences Between a Stoat and a Weasel?